American rocket pioneer; co-founder of Aerojet, inventor of solid rocket propellant and American inventor of the storable liquid rocket. Dabbled in the occult, expelled from Aerojet on DoD orders. Killed mixing rocket fuel in his garage. Born: 1914-10-02. Died: 1952-06-17. Birth Place: Pasadena, California. Jack Parsons was the wildest of the CalTech "suicide squad", a group of rocket researchers that founded the Aerojet company. His incredible energy fed the entire group, and was generally credited with being the motive power behind the incredible technical progress they made in a few short years. Parsons was raised in Pasadena, in his wealthy grandparent's home, the only son of his divorced mother. He had a tremendous range of interests, and the money to indulge them. He was fascinated in the occult, science fiction, and space exploration at an early age - discussing rocket technology with Wernher von Braun in transatlantic phone calls. The stock market crash of 1929 wiped out the family's income, and Parsons found himself living alone with his mother in reduced circumstances. In high school he met Ed Forman, and they began experiments with chemical explosives in the Arroyo Seco behind Parsons' house. He slowly made contacts at nearby Caltech, finally linking up with Frank Malina, a student there with an equal passion for rocketry and space travel. Professor Theodor von Karman took an interest in the group's progress, and obtained facilities and modest funding for their experiments. Malina, and later Martin Summerfield, provided the scientific and mathematical basis for the work, while Parsons was the intuitive alchemist. It was Parsons who came up with the combination of potassium perchlorate and roofing tar, which led to all solid-fuel rockets in use in the 21st Century. He also proved the use of red fuming nitric acid as a room-temperature oxidizer to replace cryogenic liquid oxygen in liquid rocket engines. By the end of high school, Parsons was six feet, one inch tall, with dark wavy hair, a fashionable moustache and penetrating dark eyes -- irresistible to women. At the same time he was active in science fiction circles in Los Angeles and became increasingly involved in the occult. He became the leader of Aleister Crowley's Thelema cult in Los Angeles, leading a small coven of acolytes. In common with others in the intellectual milieu of the time, he also dabbled in leftist political meetings. Parsons was one of the founding members of Aerojet in 1943, and his solid propellant formulation was the key to the company's first commercial success - JATO rockets to assist over-laden military aircraft in take-off. This product was so successful that the Pentagon made the takeover of Aerojet by a major corporation a precondition for the large contracts they wished to place. General Tire took over the company, and brought in their leading politically-connected tire salesmen to run it. In the new company environment Parsons could not possibly fit in. His unorthodox and unsafe working methods had no place at a government contractor. His attendance of political meetings, and his scandalous black magic sessions, with stories of orgies, made it impossible to maintain the security clearance he needed to continue working in his own company. Through the LA science fiction society Parsons met L Ron Hubbard, who was fascinated by the details of the new cult Parsons had developed as a spin-off of Crowley's. In 1945-1946 Hubbard became increasingly involved with Parsons, the break finally coming only after Hubbard had stolen Parson's boat, his money, his common-law wife, and the major features of Parson's cult. Parsons was able to support himself by working as a consulting chemist, including expert testimony in court cases involving explosives. But his cult fell apart, his finances were marginal, and he was kept from doing the work he truly loved. In 1952, Parsons dropped a bottle of fulminate of mercury in his garage laboratory. The explosion killed him. His mother committed suicide after hearing the news. Country: USA. Bibliography: 4474, 4475, 480, 5869. 1914 October 2 - . 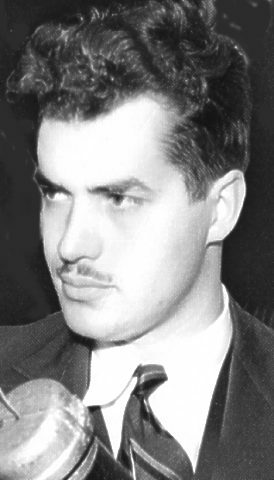 Birth of John Marvel Whiteside 'Jack' Parsons - . Nation: USA. Related Persons: Parsons. American rocket pioneer; co-founder of Aerojet, inventor of solid rocket propellant and American inventor of the storable liquid rocket. Dabbled in the occult, expelled from Aerojet on DoD orders. Killed mixing rocket fuel in his garage..
1952 June 17 - . Death of John Marvel Whiteside 'Jack' Parsons - . Nation: USA. Related Persons: Parsons. American rocket pioneer; co-founder of Aerojet, inventor of solid rocket propellant and American inventor of the storable liquid rocket. Dabbled in the occult, expelled from Aerojet on DoD orders. Killed mixing rocket fuel in his garage..